You can learn how to make the perfect roast beef in the oven. In fact, I think it is one of the easiest main dishes to make. Growing up it was on Sundays we would enjoy a Roast Beef. As an adult, I make these on long weekends during the cooler months. There is just something about having a marvelous hearty roast to serve for dinner. These are quite uncomplicated to make. Often I have put these in a crockpot, but there is something about a slow roasted roast beef that is so hard to resist. You can use almost any cut of meat when making roast beef. I have used anything from a rib-eye roast to a rump roast, a sirloin roast, or even a chuck roast. All of these cuts taste quite good. Often my choice depends on solon what is available for sale. This last week it happened to be that ribeye roasts were on sale. 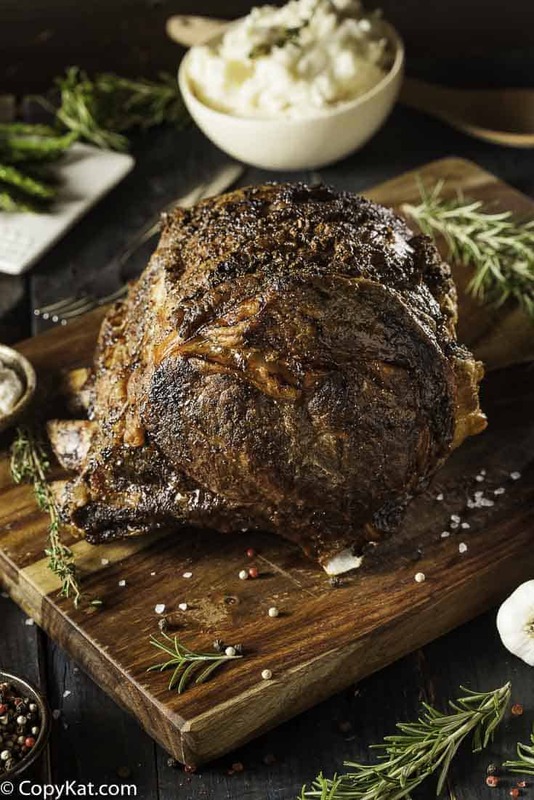 These are also known as standing rib roasts when the bone is left in the roast. Learn how to cook to a ribeye roast. So years ago I was a co-manager at a Kroger store. During my training, we received a fair amount of training to the store. I spent a month working in a butcher shop. It was there I learned about different grades of meat. Typically in the grocery stores, you will see three distinct grades of meat, those are select, choice, and prime. Prime grade beef is the beef that is the highest of quality. The fat marbling is throughout the meat. Prime beef has a lot of marbling throughout the meat, less than 5% of all meat is graded prime beef. The next best grade of beef is the choice; it has less marbling than Prime but more than Select. What I honestly like to do is to watch when meat goes on sale is to look at what grade of beef it is. I like to compare the price of Prime and Choice grade beef, if the difference is small, I will choose the Prime beef. It is the fat that gives you the flavor as well as the ability to make gravy and Yorkshire pudding. There is a lot of discussion around how to season a roast. If you want to marinate your roast, you need to do it a couple of days in advance. It takes times for the flavors to penetrate past the outside surface area of the meat. If you are going to take the meat from the package and cook it, your options are more limited. The flavors you add aren’t going to make it all of the way through the meat. The old standbys of salt and pepper will do the job for you. You can always serve your roast with beef gravy, Au Jus, or a wine reduction sauce. There is no need to worry about getting a special seasoning together; I promise salt and pepper will do the job quite well. Ideally, you should cook the roast low and slow. This has some advantages overcooking the meat as quickly as it can be cooked. By cooking it at a lower temperature the juices within the meat are retained, your final result will be more tender and retain more of the juices. Cooking slower means that the meat will cook more evenly, roasts are not always uniformly shaped you don’t want portions of the meat to be overcooked. So by slow cooking the roast, you ensure that it will cook more evenly. Do you need to cover the roast? You do not need to cover the meat in this style of cooking. Here we are roasting. When you make a pot roast you are braising the beef. Braising means cooking with liquid. Both roasting meat and braising meat are both great ways to cook beef, but they are different from each other. So you have cooked your roast perfectly, what should you do now? Wait, wait for 15 to 30 minutes. Why should you wait? This will give the meat a chance to rest. What does it mean to rest a roast? It means that the juices within the roast will get an opportunity to redistribute over the roast. This has a few advantages you can prepare the gravy, set the table, or even make some Yorkshire pudding while the meat is resting. You can cut it immediately when you remove it from the oven, but if you wait a few minutes, it will pay off. So when you pull the roast out of the oven cover it with foil and let it rest before carving it up. You can sear the beef if you like. To searing can help brown the roast on the outside. Some people believe this gives the roast a better flavor. I am not entirely satisfied if it enhances the flavor, but it makes the beef look wonderful and brown. To sear the beef, I suggest an iron skillet. I add some oil the pan, a good tablespoon; I like to use an oil that has a high smoke point. So something like canola, or your generic vegetable oil will be perfect. Fancy olive oil tends to burn at a lower temperature, so it isn’t ideal for this use. Season the meat, and put it into the hot skillet with the hot oil. Let the meat rest there for a couple of minutes on each side. If you try to move the meat around initially, it will stick. It is counter-intuitive but wait, when the meat is brown it will let you pull it to flip it on the other side. Continue this process until all sides are browned. This step is not necessary for this recipe. Why would you truss a roast, you can truss a roast to help force it into a more smooth shape? This will contribute to cooking the roast evenly evening. It also can make the roast easier to slice when it comes time to slice the beef. Did you know that often you can ask the butcher to truss the roast for you? You can also truss the roast yourself with some butchers string that is sold in most grocery stores. 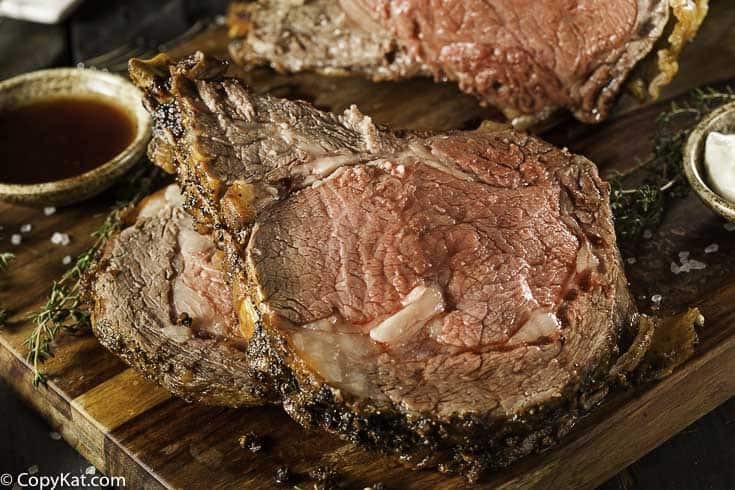 Outback Steakhouse Tiger Sauce – this is a horseradish sauce that is perfect for roast beef. Homemade Mashed Potatoes – learn how to make delicious homemade mashed potatoes. Easy Oven Roasted Red Potatoes – This is a super easy side dish to make while making your roast. You can make the perfect roast beef in your oven, it's actually very easy to cook a roast! To prepare the meat remove from the refrigerator 60 minutes before cooking. This will give the roast a chance to reach room temperature. Preheat oven to 325 degrees. If the roast is very lean you may want to drizzle a tablespoon of olive oil or two over the roast. Sprinkle salt and pepper over the roast. Place the roast on a wire rack on a baking sheet. Bake the roast for approximately 25 to 30 minutes for every pound of meat for a roast to be cooked to medium. Adjust accordingly for your preferred level of doneness. You should use a meat thermometer to determine when the roast is done. Push the meat thermometer all of the way into the center of the roast. Pull the roast from the oven when the inside temperature of the roast is about 10 degrees less than your desired level of doneness. The temperature of the roast may rise while the roast is cooking. 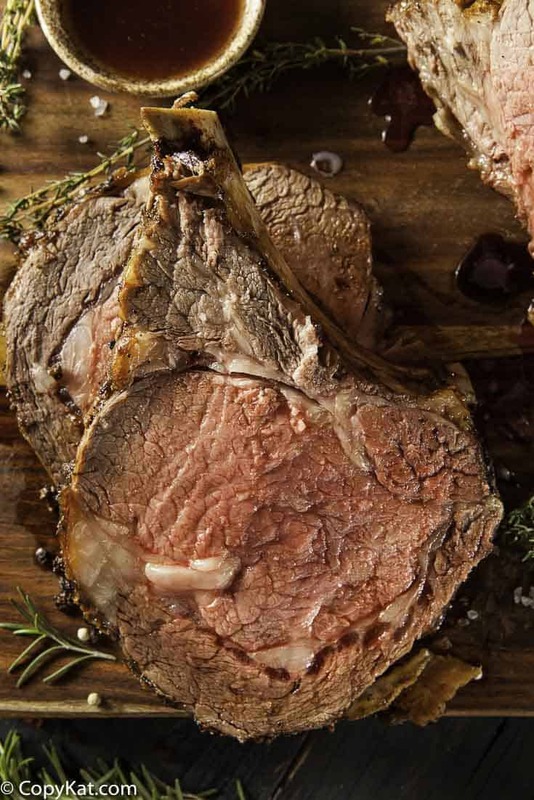 Let the roast rest for at least 15 minutes, tented in aluminum foil to keep warm, before carving to serve.Rare : 120 - 130 degrees - bright purple red, tender, juicy Medium Rare: 130-135 degrees - bright red, warm, tender very juicy Medium: 135 -145 degrees - rich pink, slightly juicy Medium well: 145 - 155 degrees - tan with slight pink, firm, slight juice Well Done: 155 and above - tan to brown, very little juice, meat can become toughSo if you want a medium rare roast remove it from the oven when the internal temperature reaches 120, it will rest for 15 minutes. The internal temperature will rise while the meat is resting. It is always best to use a meat thermometer if you have one to ensure you cook the roast to your desired level of doneness.PLEASE NOTE: Your cooking time depends on the size of your roast. I tried this recipe in my Cast Iron Ceramic Coated 3-Quart Pot. I seared the roast in the pot and then removed it then I seared the veggies in the juices of the seared roast. I then placed the roast back into the pot on top of the veggies (Quartered potato’s; Celery cut inch and a half long on diagonal; Two Cloves garlic; half white onion cut thickly and chopped thickly; salt and pepper to taste; 8-ounces of ginger ale; 3-ounces Balsamic Vinegar and 2-cups Britta water; Place in oven pre=heated to 375 degree oven and bake for 3 and a half hours and you can test for doneness of the roast. You can use a meat thermometer, or you can figure it will take about 15 to 20 minutes per pound to cook at 350 degrees. I always sear my roasts before cooking them. Take aa bit of advice, sear them on your gas grill, of course, if you have one…oil the roast up and season it first, this way your house won’t be filled with smoke. I love your recipes and your videos. This roast is just what I was looking for. Thought I had to do much more to get a perfect roast but i see it really is easy. I do have to mention that the closed caption feature on this video is very bad. The words are so mixed up that it is almost impossible to follow. Oh one more question! Can i cook this in a baking pan along with potatoes carrots and onions? Should I do anything special to the veggies? Do I need to wrap it up in tin foil first? Do I need to cover any of this with oil first and if so what kind and how much? Thank you!! I would start the vegetables in the last 60 to 90 minutes. I would chop up the desired vegetables, coat with oil, and place in a pan beside the roast. You could also use some of the roast drippings to coat the vegetables before roasting them. Hi! Thank you for your article! If I cook a roast and then want to eat it the next day – how do I store it, and how do I reheat it? How long can I store it and re-heat/eat it for? Thanks! Hi Stephanie, your recipe sounds good. I have a tied lean beef roast, sirloin I think that has been marinating for 2 days…can’t wait to bake it. According to your tips, 4 lbs seared first and then on a wire rack into the oven at 325 for 2 hours. Does that sound right? If you are going to roast like in this recipe, there isn’t a need to sear it first. Your cooking time sounds about right. I am confused about the times and temp. settings. First you say to set the oven at 325 deg, but then you say to set the oven for around 150 deg if you want it med well. My roast is about 1.3 lbs. I plan on cooking this for the 1st time tomorrow and could use the help. You set the oven to 325, but you cook it until the meat reaches the 150-degree temperature. You should prob just eat out. your juice is dripping is the only reason I would see smoke building! Add a little water to your drip pan so the fat isn’t burning up and also adds steam! I want to make a Pepperoncini Roast in the oven. I’ve made it in the crockpot before but this one is for 8 adults and I don’t think it would fit in my crockpot! You’re probably familiar with the recipe in that it calls for au jus and ranch dressing mix poured over the top, etc. Would I cover this then? I’m thinking about 10 lbs, and hoping for a moist “fall apart” roast like I get in the crockpot. Is this result possible in the oven? Any guidance would be appreciated! Just found this site today and love it! Thanks! I think you could make it in the oven, you may want to put it in an oven bag, but the time will have to be adjusted slightly, I believe it is 20 minutes at a pound at 350 degrees if you want to bake it. I bought two roasts to cook at the same time, in a magnalite pot, and in total they are about 6 lbs, however, I cut them each in half so I have four big pieces. My question is about timing… do I have to go by the total weight or can I cook less time? by my estimate it seems like 4 hours but that also seems too long. at 350. I think 4 hours would be way too long as well. Sounds like you would have 1.5 pounds roasts, so I would adjust my cooking time for 1.5 pound roasts and see how they come out. You may need to add more cooking time, but that is where I would start. when you use a meat thermometer, should you put it in from the very beginning and leave it there or put it in to check the temp at the end of cooking? Be safe! I don’t think that is going to take over 30 minutes. I would check in about 20-25 minutes for doneness. I have a 2.61lb prime rib roast. I want it to be med rare to med… How long do i cook for.? Or should i use a crock pot? So first off Merry Christmas. My recipe is to make your roast in the oven, using a dry method. I definitely don’t recommend a crock pot for this recipe. I would put it in the oven at 350 as suggested, and cook it for about 35 to 40 minutes and check the temperature with a meat thermometer, then adjust your time as necessary. I cook fat side up, as I like the juices to flow through the meat while it is cooking. I had a 10 lb. choice rump roast. I set the oven to 325 degrees F. I put it on a wire rack with just a small amount of beef broth in the pan. By the calculations it should have taken around 5 hours to cook. I pulled it out after about 3 hours and it was the toughest piece of meat I have ever cooked. I only opened the door once to check the internal temperature, which was at 116. When I checked it again an hour later it was at 145. I wanted to remove it when it reach 125, so I realized that I should have checked it again after about half an hour. But, could someone please tell me what I have done wrong? Let’s see 10 x 25 = 250 minutes (this is the rough cut for time). 250 minutes/ 60 (60 minutes per hour) would be about 4 hours. A question for you is your oven by chance convection? This can make things cook faster. Here is another site to triangulate the cooking length of time. It’s past now, but when the internal temperature is close to when you want to pull it out for me, I start to monitor it much more closely. Perhaps you could have checked the roast 15 to 30 minutes after it was at 116 degrees. Different cuts of meat come in all sorts of shapes can sizes, so cooking times can vary a bit. After it rested for a couple of hours it was much better. The flavor was wonderful, only the meat was still a little tough. I think it was just the cut of meat I used. I didn’t turn the meat while cooking, so I ended up with the top half being medium well and the bottom half closer to medium rare. Next time I’ll just use a much smaller roast. Great recipe, thank you. So that is a naturally more tough cut of meat, you can dry cook them just fine. You may want to adjust your rack, it sounds like the top rack was a little close to the heating element on the top. Perhaps you roast was a little tall, and it needed to be placed on the rack one notch lower.